The BMW X3 invoice price and the true dealer cost are not the same. Note: The BMW X3 pricing report below does not include rebates or incentives. View BMW Rebates and Incentives. The 2019 BMW X3 models offer drivers an excellently smooth ride because it is easy to handle. Its cabin is finely finished, and it has technological options that make it ideal for tech savvy drivers. The model has a passenger capacity of five and is available as an SUV/Crossover. The 2019 BMW X3 models are a carryover from what was available in the 2018 model. The only new feature is that the new X3 has grown and it now appears more prominent and more appealing as compared to its predecessors. The model builds on the X3 model that was introduced by BMW in 2018. Some of the features that make it stand out from its competitors include its fuel efficiency, a spacious interior, a powerful engine, and advanced technologies that are standard for the base trim level. The new BMW X3 is available as either a rear-wheel drive or an all-wheel drive model. The 2019 BMW X3 is available in three trim levels: sDrive30I, xDrive30I, and the M40i. The asking price for the sDrive30i and xDrive30i trims can be as low as $40,000 while the more advanced M40i has an asking price of above $50,000. The xDrive30i model and the sDrive30i are popular among many car enthusiasts because they feature many comfort and convenience features that are limited to the X3 models. Once you choose the transmission system, you will also need to decide whether you need to go for the premium high-performance M40i trim level, the xDrive30i trim, or sDrive30i based on each trim's specifications. The X3 sDrive30i model is available at a base price of $41,000. It features a four-cylinder 248hp engine that is coupled with an 8-speed auto transmission and a rear-wheel drive system. Buyers also have the option of enjoying the M Sport design for an extra $5,300. Standard features for the sDrive30i include Bluetooth Connectivity, tri-zone auto climate control, a rearview camera, a 12-speaker audio output system, and a single USB port. The driver assists and safety technologies for the model include a driver drowsiness monitoring system, front and rear parking sensors, an auto emergency braking system, a forward collision warning, and pedestrian detection. The model's iDrive infotainment system offers a 6.5-inch LCD touchscreen. The system, however, has no Android Auto integration. Buyers who opt for this trim level will have to pay $42,650. The X3 xDrive30i model has features similar to what the sDrive30i model offers except that it comes fitted with an all-wheel drive (AWD). The asking price for the M40i is $54,500. It features a turbocharged six-cylinder engine that comes coupled with all-wheel drive to achieve a 355 horsepower output. It also has all the standard features available in the sdrive30i and sDrive30i. Other advanced features for the X3 M40i model include a satellite radio, a panoramic moonroof, M Sport brakes, M Sport suspension, and 14-way power-adjustable driver and front passenger seats. The premium package comes with features like navigation, heated seats, head-up display, and heated steering wheels at an extra cost of $2,950. This package is available for an extra $2,550 and offers features like a surround-view camera and parallel park assist technology, among many other comfort features. The BMW X3 model is available in two powertrain options that offer excellent fuel economy as compared to other models in the same class. The fuel economy you get, however, will vary based on the powertrain that you choose. The turbocharged four-cylinder engine achieves a power of 248-hp while the six-cylinder turbocharged engine peaks at 355-hp. The model can accelerate from 0-60 mph in just 5 seconds. The X3 models have an estimated combined fuel economy of 26 mpg with 23 mpg (city) and 30 mpg (highway), thus giving you a great fuel economy. You can expect the new X3 model to give you a fantastic driving experience as compared to what most compact SUVs will offer. This is because the model offers unmatched comfort and comes with an accurate steering wheel for better handling. For a driving experience that is even more enhanced, buyers can opt for the Driving Assistance and Driving Assistance Plus packages that come at an extra cost. 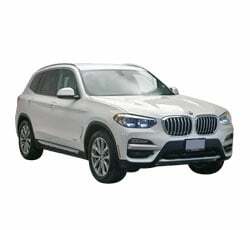 The 2019 BMW X3 is an SUV/Crossover that combines fuel efficiency and comfort to give any driver value for his or her money. The model is ideal for any buyer who is shopping for a Crossover that is fun to drive while offering practical hauling abilities. Make sure to check it out before settling on any other model. Example: Base BMW X3 invoice price + the dealer Invoice price of options + destination - Holdback = Total Dealer Cost. Note: All BMW X3 MSRP, invoice and dealer cost dollar figures above are approximate amounts. Prices are subject to change without notice.